Aztlán Mural (originally named Guadalupe Mural) depicts the struggles Mexican-Americans faced in Lubbock, such as the 1970 tornado that ripped through the city's Guadalupe neighborhood. The Lubbock Brown Berets originally commissioned the mural. Both the mural and Aztlán Park, where the mural is located, were dedicated Both Aztlán Park and Aztlán Mural were dedicated on July 31, 1977. New York-based, Bolivian-born artist Fernando Penaloza first designed and painted the mural. Colorado artist Emanuel Martinez has restored the mural twice. Photograph by Joel Zapata, uploaded with permission of Emanuel Martinez. 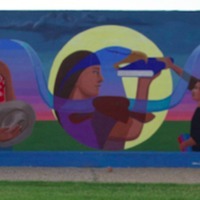 “Aztlán Mural (originally Guadalupe Mural),” Chicana/o Activism in the Southern Plains Through Time and Space, accessed April 19, 2019, https://plainsmovement.com/items/show/20.